Augmented Reality is not like Virtual reality which totally replaces the real world for the virtual world. Rather, AR superimposes graphics, sounds, video and GPS and other computer-generated inputs over the real world. Although the information is virtual, the interaction is done in real time and in the real world. The Augmented Reality industry is expected to be worth over $90 billion by the year 2020. Already, AR has revolutionized the way we see the world. Its impact is already being felt in different industries such as the Game, Automobile, Education, and Health, etc. Unlike Virtual Reality which closes you off from the real world into a virtual environment. The healthcare sector has been given a new lease of life through augmented reality. Medical professionals have leveraged on AR to carry out their day to day activities. Doctors are really excited with Augmented Reality because just by wearing the AR goggles and using the AR app, they can have x-ray vision. They can see the organs of a patient in 3D overlaid on their body, without having to make an incision. Med students can study human anatomy with ease. Patients can have a deeper understanding of their diseases. It is not unusual for people to throw away the packaging and the paper description of the drugs they purchase. This is because they seldom understand the description. Trying to understand how a drug works by reading its label can be a herculean task. Thanks to AR, this habit is changing. AR technology makes it easy for Doctors to be able to show the patients how some drugs work when they are ingested by the body. Through Augmented Reality, patients can scan packaged or printed materials to discover the benefits of drugs and the mode of action. For example, patients are now able to scan drugs and have instant access to drug description. On their mobile devices, they can have access to accurately presented instructions and guidelines via augmented reality. With a clear understanding of how drugs work and the mechanism behind them, the issue of drug abuse and wrong use of drugs will be greatly reduced. This application is as beneficial to patients as it is to doctors, nurses, and very one involved in the treatment and prescription of drugs. Medical Professionals use augmented brochures to educate and train doctors on new therapies, drugs, and inventions. Professors at dental schools use AR for their coursework and practical to introduce students to dental models, which enable them to compare their sculpting to the reference models. Students can easily access medical models wherever they are. All they have to do is scan the custom trackers, and the models will pop up on their screens. Augmented reality bridges the communication gap between professors and students, and further demystifies the images and text found in the textbooks. Augmented Reality is a great communication tool. An AR app development company that produces and sell drugs can use immersive AR content to engage employees, investors, and partners. With AR, they can easily communicate with their employee's new inventions, breakthrough, ideas and projects they want to carry out. Such communication promotes a deep understanding of the firm’s vision. Companies can use AR to promote and market their products, record higher sales and compete favorably with their contemporaries. Firms that produce medical equipment and tools have to do a lot of packaging and display. They also have to design and ship prototypes of the equipment. Prototyping may be very expensive and time-consuming, but it has to be done. Clients need to assess products; their functionality and usability, in order to make informed purchase decisions. With augmented reality, there is no need to present a heavy catalog of your products to people. Your customers do not need to visit your factory to inspect your products. They can have access to all your products from their mobile devices. Although nothing is entirely devoid of risks, AR technology ensures you make fewer mistakes in medicine. How does that work? 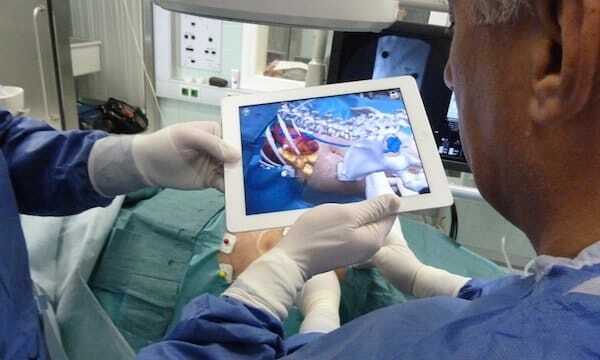 Surgeons, for example, can use the step-by-step procedures AR provides in real-time to project useful medical data on the patient without performing an operation. AR technology promotes accuracy and excellence because Surgeons can “practice” on patients before carrying out the real operation. They will make fewer mistakes when faced with the real deal. AR can ease painful and unpleasant medical procedure such as taking blood samples. Some of us may have experienced a situation where the nurses kept inserting needles in and out of our bodies in search of suitable veins. This situation can be creepy and unpleasant for some people. Apps like ‘AccuVein’ (a hand-held scanner) can be used to scan the veins on a patient’s skin so that doctor and nurses can easily locate veins before inserting needles. Also, when it comes to thorough detection of particular disorders such as skin cancer, this technology can help monitor life-threatening diseases like Cancer of the Skin early. Early diagnosis is sure to result in better treatment, Management, and Prevention of such deadly diseases. AR technology can be used to care for patients even after they recover and leave the hospital. While at home, patients may be required to continue certain drugs for his or her total wellbeing. It may be difficult to keep track of drugs and other therapeutic exercises, especially for the elderly. This is where Augmented Reality steps in and saves the day! Google Glass, for example, can act as their personal assistant. It can remind them to take their drugs at the specific times. It can also encourage them to exercise and eat aright. Have you ever been in a situation where you are a doctor and cannot effectively and accurately explain your symptoms? This happens every day in hospitals around the world. Such wrong descriptions often lead to inappropriate drug prescription. Thanks to Augmented Reality, that vicious cycle has ended. Patients are now able to describe their symptoms with mobile applications accurately. Doctors use applications to simulate different problem for patients. This allows them to identify the sets of symptoms that match theirs easily. Some apps come with tools that help patients describe and demonstrate how they are feeling. Better symptom description will surely lead to better drug prescription and treatment. There are many apps developed by AR app development companies that improve the quality of the healthcare sector. Some of them (VA-SAT and Eye Decide) help those with impaired vision to see while others like ‘Saagara’ improve the overall physical and mental health. Some of them even help boost the brains of autistic children. As Medical experts and AR app development companies continue to carry out groundbreaking research into the field, we are certain that the future of AR is very bright.